Even by modern-day standards, Cecil B. DeMille was a cinematic phenomenon. In a 42 year directorial career he remade his own films (including The Squaw Man twice) and also acted as producer for a great number of his output. He was also an actor, most famously in Sunset Boulevard(1950) where he played himself in what was effectively an homage to the glory days of Paramount. Away from the cameras, DeMille hosted the popular Lux Radio Theater series for eight years and is generally credited as establishing film production of longer films in Hollywood. Despite all these accomplishments, he is perhaps best known today as the man who directed some of the greatest Biblical epics ever made- The King of Kings(1927) and especially The Ten Commandments(1923, remade in 1956). Typically, in the capricious modern era where we cannot, it seems, have heroes anymore, DeMille is sometimes criticised for his old-fashioned subject-matter and overblown production values, but is he really that different from someone like Jerry Bruckheimer in terms of his scope and vision? Futile comparisons to modern directors aside, most will have heard DeMille’s name but few know much about the man himself. Simon Louvish’s latest venture into exploring Hollywood greats takes the reader on a journey through the director’s life in Cecil B. DeMille and the Golden Calf, a story almost worthy of Mr. DeMille himself. Louvish’s book is divided up into five main sections (‘reels’) which each subdivide into chapters. As might befit DeMille, a prologue and an epilogue are on hand to bookend his story, the latter being followed by an extremely thorough reference section and an equally detailed ‘playography’ plus a filmography which also includes notes as to the survival status of the films concerned. Fortunately, despite the massive gaps in silent film history, not many of DeMille’s films are missing- this is particularly lucky as the vast majority of his films as director were made in the pre-talkie era. Born on 12th August 1881, and therefore a mere teenager when the Lumieres premiered their ‘Cinematographe’ in Paris in 1895, DeMille’s upbringing led not unnaturally toward the theatre given his penchant for artistic creation. It is interesting to note that David Belasco, ‘the most dynamic force on the American stage’ (p.7), upon modifying DeMille’s play (whose title was later changed to The Return of Peter Grimm), incurred the wrath of the future Hollywood director. Beyond such basic virtues as honesty and integrity, this was a personal vision tampered with and then transformed- something that DeMille would later resist as he exerted a tight control over his films. An incident such as this shows that the seeds of DeMille’s future were sown early on, and also highlights his determination to succeed. This determination, and the growing insecurities of Broadway, led to his partnership with Jesse Lasky- and the foundation of what would effectively become modern-day Hollywood. In a further justification for calling DeMille ‘the Founder of Hollywood’, it can be seen that his directorial career charted almost exactly the course of the Hollywood Studio System. Louvish rightly states that ‘Cecil B. DeMille was in the right place at the right time’ (p.119), but he still had to recognise the available opportunities and seize them. One of these opportunities was to again work with Geraldine Farrar, who had done so much to make Carmen(1915) such a success, in a 1917 film about Joan of Arc- Joan The Woman. The initial success of the film was lessened by the studio cutting the film’s length (another interference with DeMille’s authorial vision! ), and ironically led to a retrenchment which would see DeMille temporarily abandon his plans for more cinematic epics. Given his rather idiosyncratic status in Hollywood at the time, it was either predictable or utterly haphazard (depending which way you look at it) for DeMille to invite the public to choose the topic for his next film project after the release of Adam’s Rib in 1923. The result- an inspired media furore which would eventually lead to DeMille’s first version of The Ten Commandments, a film that would place him in the highest echelons of cinematic artistry. Perhaps more intriguing than its $4.5 Million box-office (making it, as Louvish notes, the most financially rewarding of all DeMille’s silent films), is the fate of the ‘gargantuan set’ (p.225) which ended up being buried in the dunes of Guadalupe. It is the sheer scale of the film which is most impressive- even today- and back in 1923 audiences had not seen anything quite resembling it since Griffith’s epics before the First World War: and that, in 1923, seemed an awful long time ago. The aftermath of The Ten Commandments and DeMille’s foray into sound film production is effortlessly handled by Louvish, who brings an exciting vivacity to the proceedings by citing such sources as the autobiography of Charles Bickford (star of DeMille’s first ‘talkie’, Dynamite(1929) which provides an almost tangible picture of his first meeting with the director. Despite the often sizeable budgets of DeMille’s sound films, their artistic success, when viewed today, is in no small part due to the charisma of the actors themselves. Thus, Cleopatra(1934) is a brilliant film not purely for the money spent on its authenticity but for the performance of Claudette Colbert as the Queen of the Nile which ‘resonates with grace and humanity’ (p.331). In resulting films DeMille would work with some of the leading ladies of the decade- Loretta Young, Jean Arthur and Barbara Stanwyck to name but three; ‘Hollywood’s favourite living legend’ (p.361) coming to the end of his monochrome era and moving resolutely into colour as America braced itself to move into the Second World War. Although the DeMille colour films of the 1940s are not as fondly remembered as those made in the monochrome 1930s, all would be eclipsed by the director’s remake of his own film The Ten Commandments in 1956. Given its legendary status, and the extensive publicity material available for the film, it could be tempting for Louvish to abandon his profile of DeMille the Man and turn his attention to DeMille the Director, thereby negating the private side in favour of the public figure. This, to his credit, he does not do- details of the making of the film are balanced with the personal preoccupations of its director, making the piece about the film both fascinating and insightful. DeMille’s death in 1959, just three years after The Ten Commandments was released, truly did mark the end of an era. In a career spanning almost fifty years and seventy films he became, as Louvish argues, a paradox- for he was on one hand as synonymous with cinema as celluloid itself yet on the other a figure few knew much about beyond the superficial. With Louvish’s book this is hopefully not now the case, for its meticulously researched and lively narrative brings DeMille alive again. If there is a criticism to be made it is the lack of a couple of groupings of still photographs- true, there are a number of illustrations, but given the visually aesthetic nature of silent cinema more is always desirable. Undoubtedly, Cecil B. DeMille was a larger-than-life figure, a man whose impatience was legendary yet his friendship warmly loyal. It is a hard task for a balance to be reached that satisfactorily reflects such a complex man, but, in Cecil B. DeMille and the Golden Calf, Simon Louvish accomplishes it to perfection. 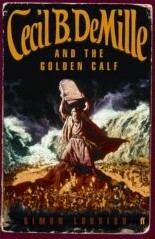 'Cecil B. DeMille and the Golden Calf' is published by Faber and Faber.